The Fidgetbum – For fidgety, wriggly sleepers! Our 6, almost 7-year-old daughter has always fidgeted. From inside my tummy, she used to wriggle and writhe all day and (mostly) night, earning her the nickname “The Wriggler” before we even met her. During the day she is an active ball of fun and energy and when bedtime comes, she is as active in her sleep as out. Up until she was 18 months, we used the amazing gro-bag sleeping bags for her to sleep in, keeping her cosy, secure and warm and allowing her to wriggle to her heart’s content. Fast forward to the new grown up bed and a proper single duvet and we have had constant battles to keep the duvet on, keep her snug and allow her (and ourselves!) a restful and blissful whole night’s sleep. Despite our best efforts to tuck her duvet in at bedtime, it never quite stretches far enough to be my tucked under the mattress securely and her nocturnal disturbances due to feeling cold and in a tangle have resulted in all of us having a disturbed night’s sleep. Bleary eyed and always listening out for the familiar pitter patter on the landing, we needed some help. But…..we have found a solution! The FIDGETBUM! And….it works!!! A clever invention by an entrepreneur Mum who, through her own experiences with inherent fidgeters, came up with an ingenious solution. 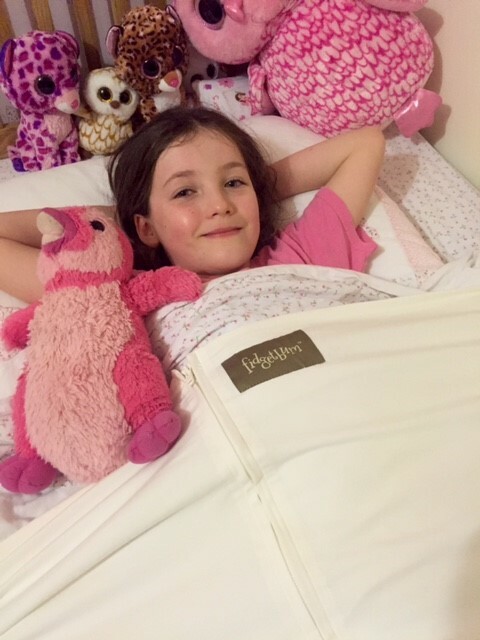 The Fidgetbum is a luxury 4-way super-stretch piece of fabric that conveniently wraps under the mattress and zips over the duvet to effectively cocoon your child and keep them warm, safe and cosy for a restful night’s sleep. So easy to use, the Fidgetbum feels super-soft, it is stretchy so the child can easily get in and out and keeps them warm and safe the whole night through. It is also machine washable and comes in a gorgeous little bag so it is portable for any sleepovers or holidays. Since using the Fidgetbum, our daughter has been as snug as a bug in a rug. She hasn’t fallen out of bed (yes, this has happened a few times)! She has not sleepwalked due to disturbance. She has been warm, cosy and secure, and most importantly we have ALL had full and contented night’s sleep! I have gone to bed with the peace of mind that my maternal instincts to protect and keep warm have been satisfied and we cannot be more grateful to the Fidgetbum team for such a fabulous and clever invention. It is now firmly part of our bedtime routine, bath, pyjamas, teeth, story and doing up the chunky zip on the Fidgetbum! So, for any parents of little fidgets and wrigglers out there, I would absolutely recommend giving Fidgetbum a try. It worked for us and could be just the solution for you! Fidgetbum’s are now available to buy in JoJoMaman Bebe, the Very catalogue and online at Fidgetbum. The lovely team at Fidgetbum are also giving away one luxury 4 way stretch Fidgetbums in either a single size or toddler size to one lucky winner in our exclusive competition running until 15th December 2017, which you can enter here. *I was sent a Fidgetbum to trial free of charge in return for my honest opinion.